Most people hate their antivirus program for many reasons. Once you buy an antivirus program, for example, you’re stuck paying an annual fee. If you ever stop, the program stops working. And when most antivirus programs do their job, they often slow down your PC by overloading it with an overblown security “suite,” which duplicates Windows’ built-in firewall and Microsoft’s free anti-spyware program (Windows Defender). To help out those who dislike or can’t afford an antivirus program, Microsoft’s shaking up the big players with Microsoft Security Essentials, a slim ‘n’ trim program that checks for incoming viruses, removes spyware, and scans your PC for viruses every week. It’s fast, unobtrusive, and it works. Plus, it’s free to owners of legitimate copies of Windows XP, Windows Vista or Windows 7. 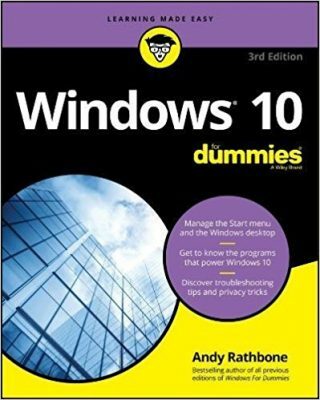 (The program doesn’t work on Windows Me, 98, or other Windows versions.) I’ve been using it for many months without problem. 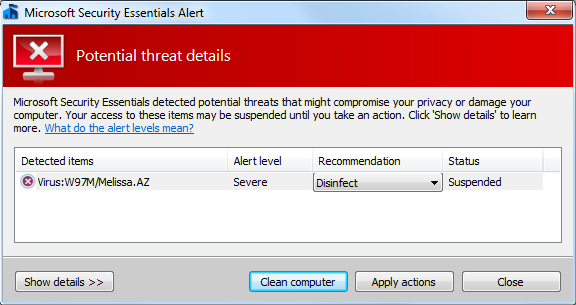 Warning: Don’t run more than one antivirus program at a time, as they cause conflicts. 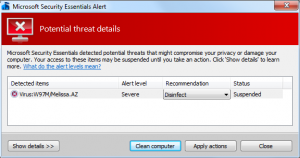 Be sure to turn off any other antivirus program before running Microsoft Security Essentials. 1. Download the program by visiting the Microsoft Security Essentials Web site and clicking the Download Now button. Choose your Windows version, if asked: Windows XP, Windows Vista (32-bit or 64-bit) or Windows 7 (32-bit or 64-bit). 2. Click Save to save the program’s installation file to your PC. Download it to a place where you can find it easily, like on your Desktop, or in either your My Documents or your Downloads folder. 3. Start the Installation program by double-clicking the downloaded file, then click Next when the installation program appears onscreen. 4. Read the licensing terms, agree to their conditions, and click Validate to make sure your Windows copy is legitimate. Here’s the only catch: Microsoft Security Essentials only installs on PCs running authentic, activated copies of Windows. PCs bought with Windows pre-installed will pass this test, as well people who’ve installed Windows themselves and gone through the activation process. But if you’re running a bootleg copy of Windows, the install won’t work. 5. When the PC passes the validation test, click Install. The program takes a few minutes to install itself and download the latest virus definitions from the Internet. 6. Click Finish to complete the installation and scan your PC for any existing viruses. The program will scan your PC for viruses during the next few minutes, but you can minimize the program while it works in the background. The program scans your entire PC on Sundays at 2 am. To change the scanning time, click the Settings tab, click Scheduled Scan from the left pane, and choose a different day or time from the drop-down menus on the right. Click the Save Changes button to save your updated scanning schedule. When you’re through, click the minimize button and let the program live in your Taskbar’s notifications area, in the lower right. The program starts automatically whenever you log onto your user account, and it notifies you whenever it detects any incoming viruses. With Microsoft Security Essentials and Windows built-in Firewall, your computer will be much more secure than most computers on the Internet. Posted: October 17th, 2009 under Free software, Windows 7, Windows Vista, Windows XP. Thanks Andy. I’ve been trusting you, and only you, since the Windows 98 days. I am really excited about this! I downloaded Security essentials a bout 2 weeks ago…..and it is soooo easy and simple!! It tells you when the automatic scans will be done and lets you change the date and time if you want!….easy easy easy!!! I am so glad you like it! !